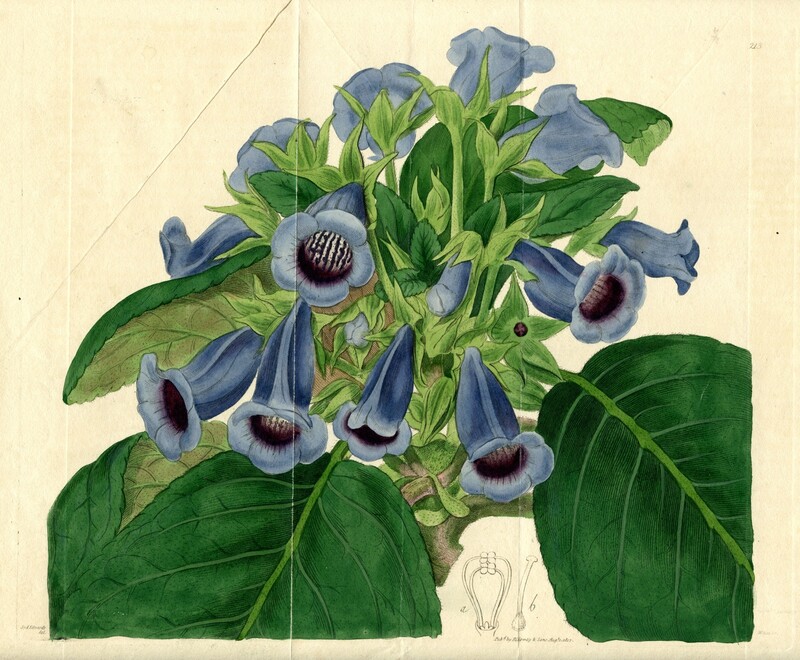 This is the hand-colored engraving illustrating the first publication of Sinningia speciosa, as Gloxinia speciosa. From Loddiges’ Botanical Cabinet, 1817. The year 2017 marks the 200th anniversary of the introduction of Sinningia speciosa into cultivation. But as you will read below, S. speciosa was originally classified in the wrong genus and spent 60 years incorrectly known as Gloxinia speciosa. The story of how Sinningia speciosa came to be known as the Florist’s Gloxinia is generally familiar to gesneriad growers, and it bears repeating here. 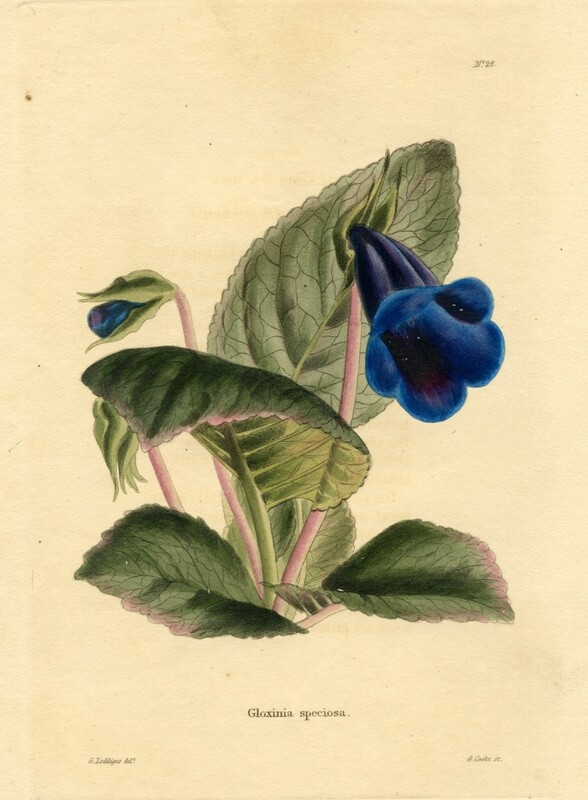 Sent to England from Brazil in 1815, the unnamed species was first published and illustrated by the English nurseryman Conrad Loddiges in the first volume of his Botanical Cabinet in 1817 as Gloxinia speciosa, and soon became known by the common name, “gloxinia” in horticultural circles. The genus Gloxinia had been established in 1785 by L’Héritier for the type species G. maculata – known today as G. perennis – a tall species with scaly rhizomes that was originally grown from seeds sent to the Chelsea Physic Garden from Colombia in 1739 (Linnaeus had named it Martynia perennis in 1753). The flowers of S. speciosa do outwardly resemble those of G. perennis, so Loddiges was correct in classifying it in the Gesneriaceae. S. speciosa remained in the genus Gloxinia until W.P. Hiern transferred it to its correct place in Sinningia Nees (established in 1825) in 1877. Over the course of 200 years, various authorities have placed S. speciosa in no fewer than six other genera (Gloxinia, Gesneria, Ligeria, Orobanche, Orthanthe, and Martynia), accounting for 38 discarded synonyms for this species, 37 of which are listed in The Smithsonian’s World Checklist of Gesneriaceae. In addition to Loddiges’ illustration, color plates of G. speciosa were featured in two other publications in 1817, which must have had something to do with increasing demand for the plants and making the common name stick. This double-size print of Sinningia speciosa, as Gloxinia speciosa, was published in Edwards’ Botanical Register in 1817, shortly after first publication in the Botanical Cabinet. It is a superior representation of the species. An exploration of the many European and American botanical publications from the 19th and early 20th centuries gives us an appreciation of how remarkably popular gloxinias were at that time, especially in Great Britain. John Sims, writing in Curtis’s Botanical Magazine (vol. 44) in 1817, remarked that the species was “… already to be found in most of the large collections about town [London]”, and Robert Sweet included it in his book Hortus Suburbanus Londinensis (A Catalogue of Plants Cultivated in the Neighborhood of London) in 1818. Plants were widely grown and admired in greenhouses and ‘stoves’ (heated rooms), and the introduction of new varieties and hybrids was cause for considerable excitement. We also know that English travelers were so fond of the plant that they took it with them to far-flung colonial settlements. There is a record of G. speciosa being among the exotic plants grown on the island of Mauritius, where it had been introduced by Governor Farquhar in 1822. We know that it had reached Bombay in India by 1839 and Kolkata by 1843, Barbados by 1848, the British Virgin Islands by 1851, Madeira and British Guiana by 1855, and Ceylon (Sri Lanka) by 1879. The earliest mention found of G. speciosa being grown in the US is in The American Gardener’s Magazine (vol. I, 1835), where it was seen in the hot-house of the Hon. John Lowell of Roxbury, MA. However, a cryptic listing in a catalogue from Bartram’s Botanical Garden near Philadelphia may push this date back to 1819. The Gesneriad Society, formerly known as the American Gloxinia and Gesneriad Society (AGGS), was founded in 1951 as the American Gloxinia Society by Elvin McDonald, who was a teenager at the time. Modern cultivars of S. speciosa with erect (peloric) flowers, in colors ranging from white through pink and red to lavender and dark purple are still widely grown in the US, Europe, and Japan. 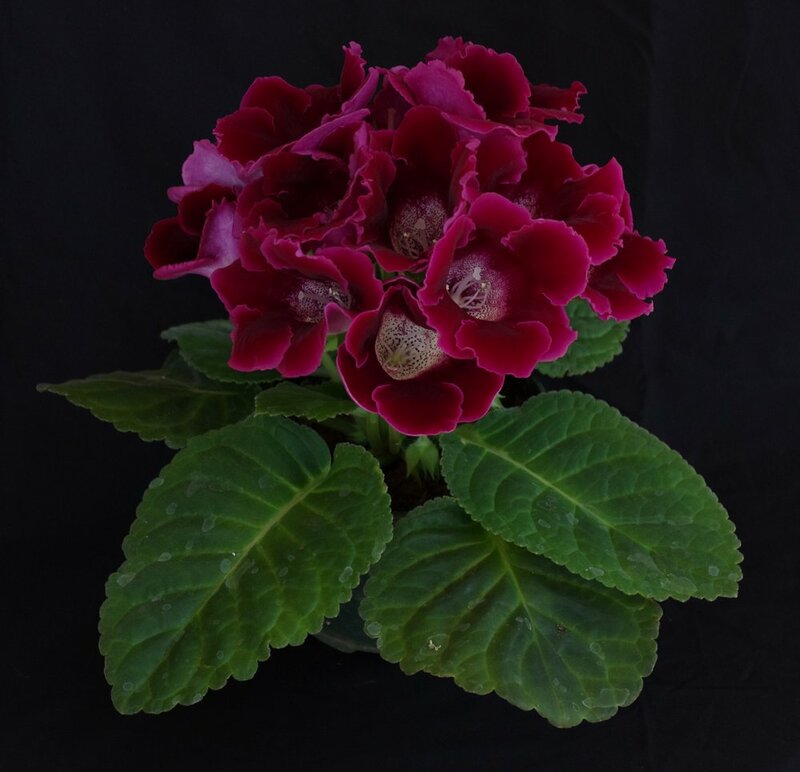 There is so much more to the history of the florist’s gloxinia, and most of the information has been uncovered, thanks in large part to the internet and the ready availability of searchable texts through Google Books and other resources. This is a modern commercial hybrid of Sinningia speciosa, grown from pelleted F1 hybrid seed produced in Japan and distributed under the name “Empress Mix”.